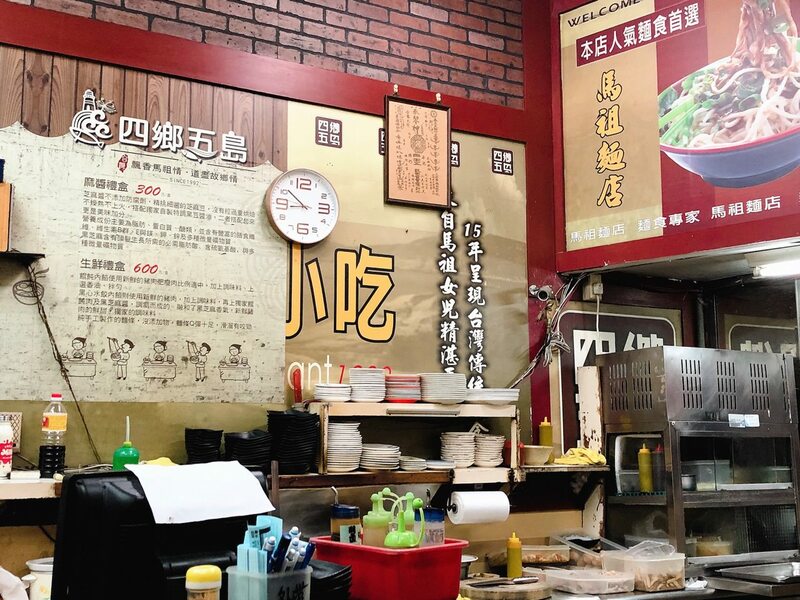 Mazu 45 Food is one of the 24 hour restaurants in Taipei City. 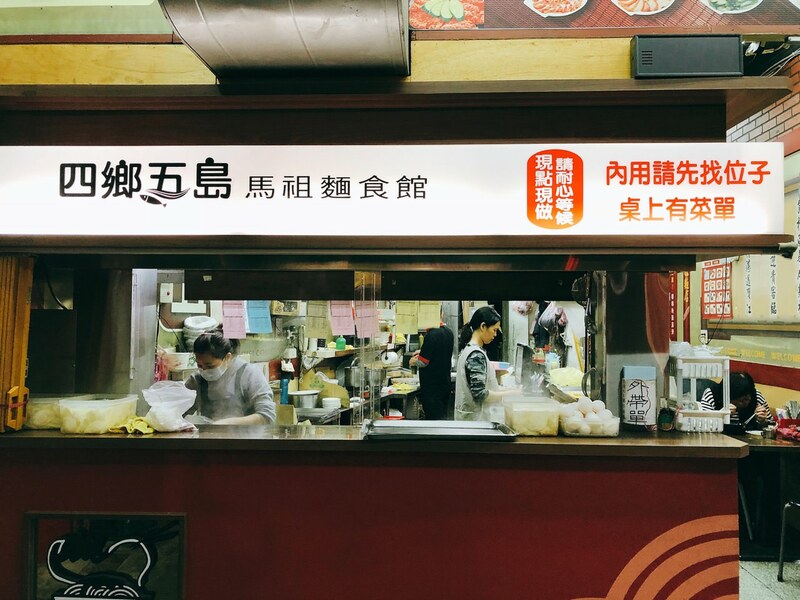 It is also one of the late night snacks option for Taipei locals. 四鄉五島馬祖麵館附近的捷運站是南京復興站, 出站後需往微風廣場方向, 即可到“王記府城肉粽”所在的八德路二段, 再往遼寧街方向可看到四鄉五島馬祖麵館. 馬祖麵館用餐空間除了一樓與二樓外, 也有隔壁有冷氣的店面座位. 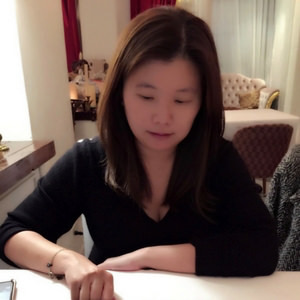 在開放式廚房旁的一樓座位比較適合需要看車的客人（因為停車位難找). 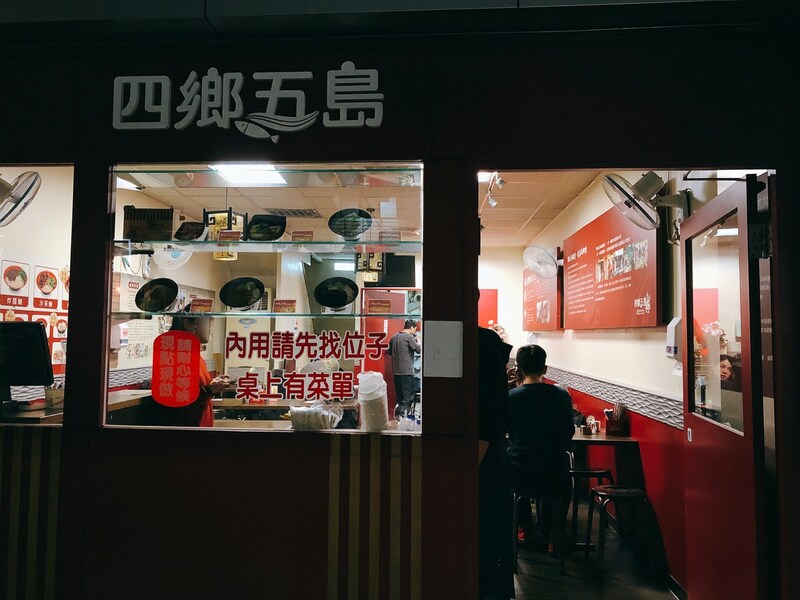 廚房櫃檯上放著店家自製小餛飩, 桌邊有店家自製辣醬和菜單, 需自行劃單點菜. The closest MRT station would be Nanking Fuxing MRT station. 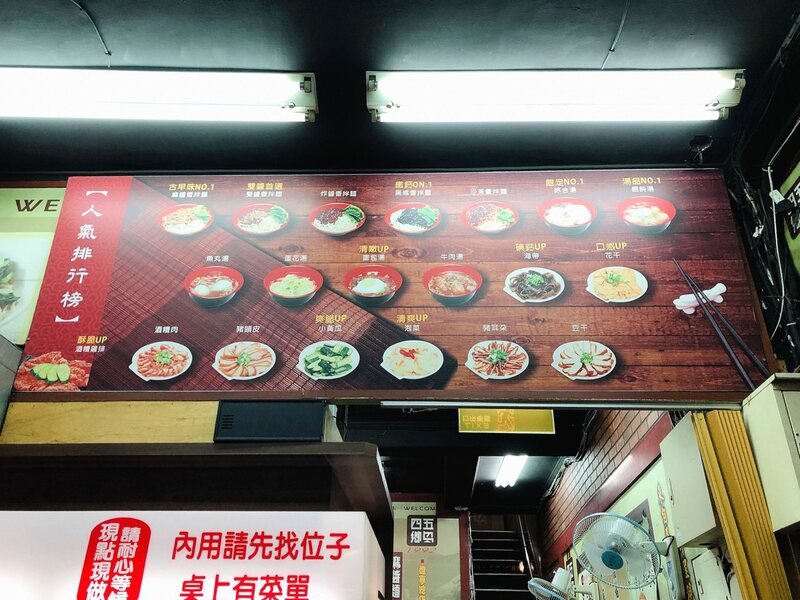 Walking toward Breeze Center, you would arrive the Baiden Road ( “Wang Ji Rice Dumplings” is also located at this street). 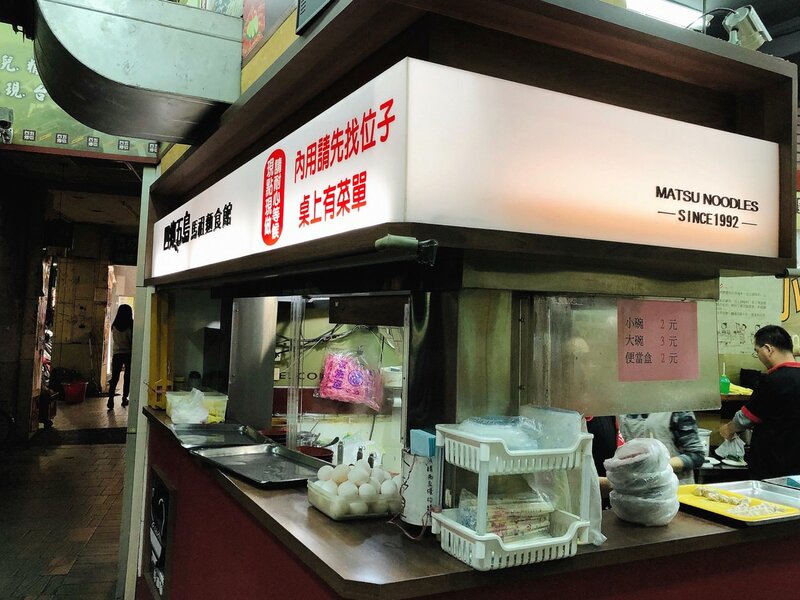 Besides 1st and 2nd floor seats, Mazu 45 Food also has the next store seats with air conditioner. 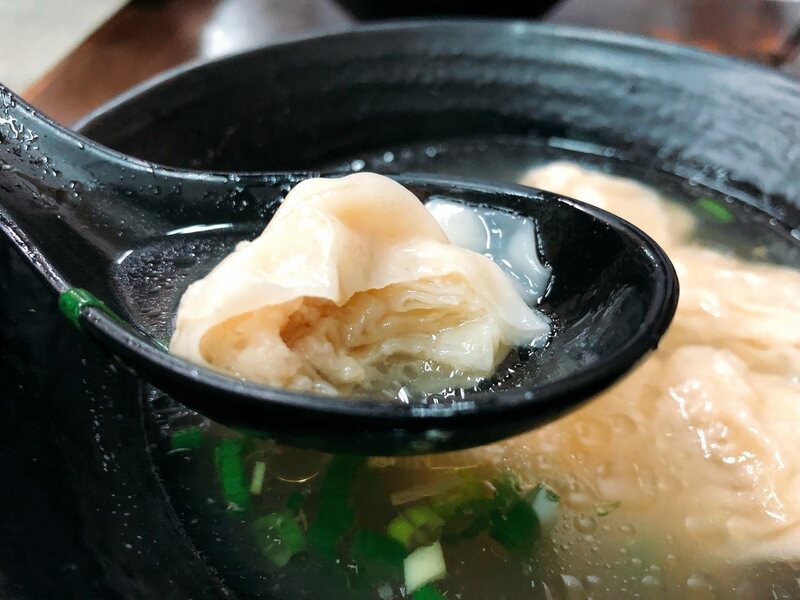 There are custom-made small soup dumplings. There are also spicy sauce and menu. 黑麻麵是四鄉五島馬祖麵館的招牌料理. 我點的是小碗 (NTD $50), 白色麵條底部藏著黑色芝麻醬, 開始攪拌時, 久違的濃郁芝麻香氣撲鼻而來, 記得要攪拌均勻讓黑麻醬附著在麵條上 (如圖), 再大口吃麵, 除了嗅覺滿足外, 舌尖更是感受到沙沙且綿稠的口感, 吃完後別忘了擦拭嘴角邊的黑醬, 這款麵比較適合可以不顧形象吃髒髒包和沾口墨魚麵的人, 我會推薦給初次造訪四鄉五島馬祖麵館或是愛吃芝麻湯圓的人. 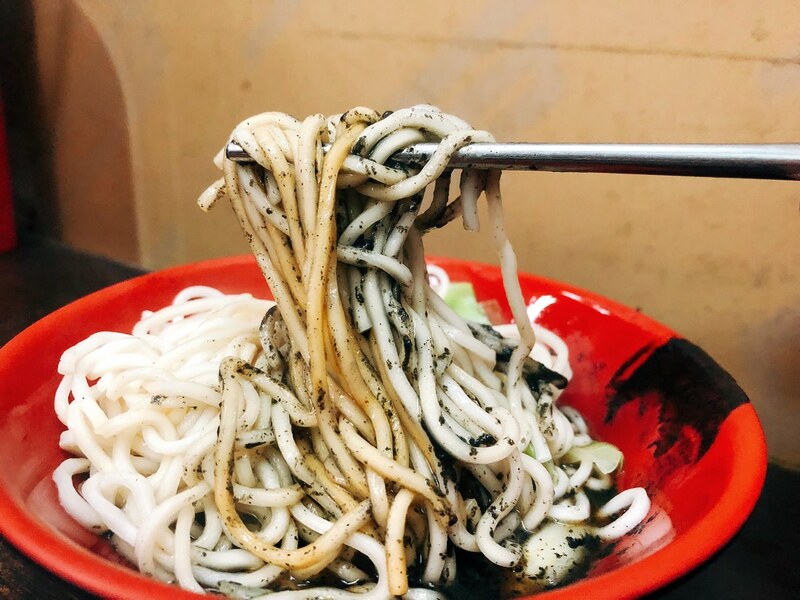 Black Sesame Noodle is one of the Mazu 45 Food signature dishes. I ordered small size (NTD $50). 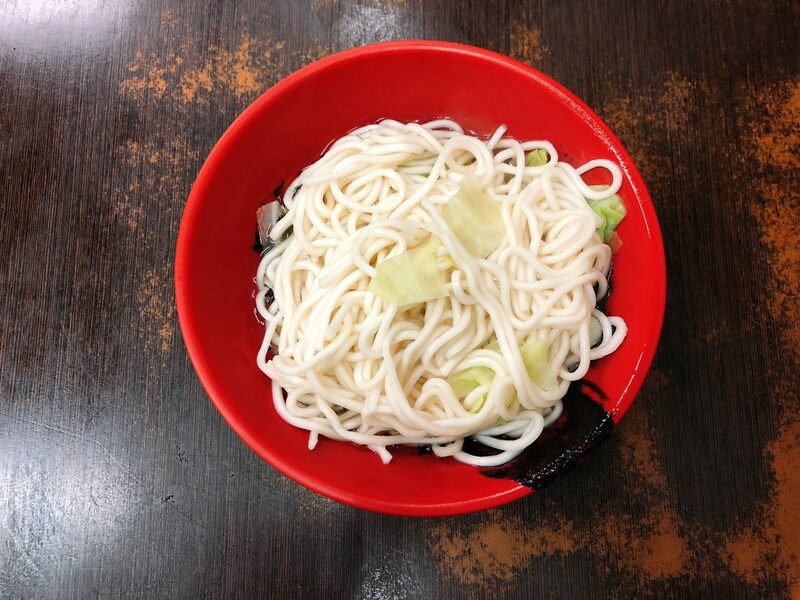 There are fair amount of black sesame sauce hidden under the white noodles. When start to stir evenly, the nose can immediately sense the thick sesame aroma. The tastebuds would sense the thick sauce texture. 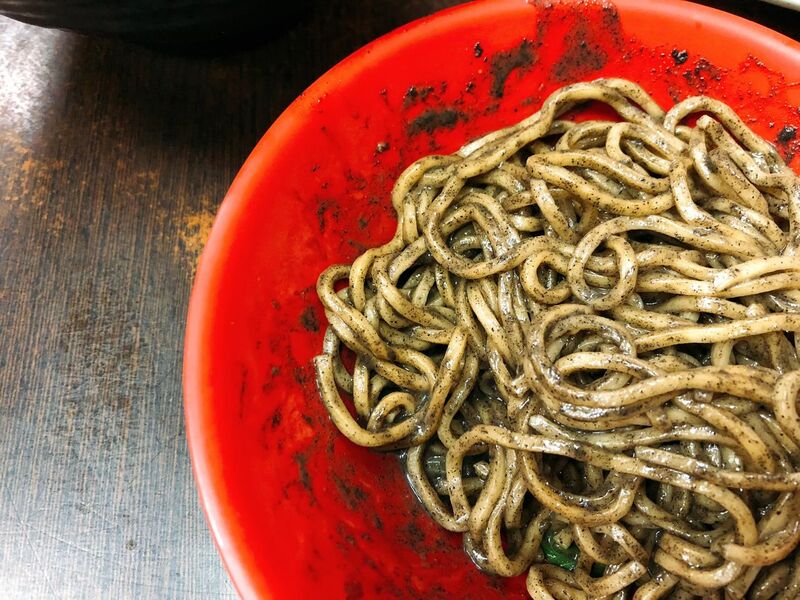 I would only recommend to people who are willing to taste black squid noodle and like to sesame rice ball. 四鄉五島馬祖麵館小碗餛飩湯有6個小餛飩, 因為成本考量, Size 當然沒有南京三民站的 “餛飩舖子”大, 由於是店家自製, 肉鮮美是無庸置疑, 只是飽足感較低, 把這道當做宵夜湯品反而比較適合, 我會建議加點其他菜餚. 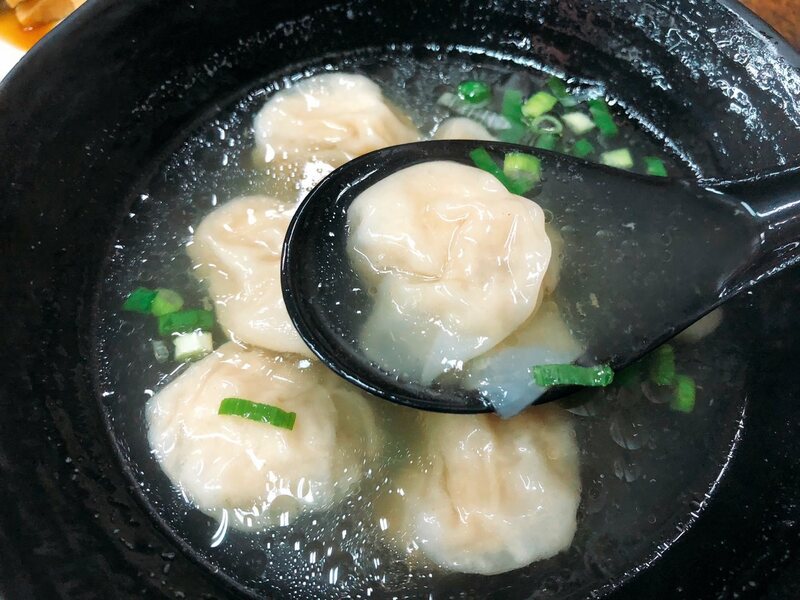 Mazu 45 Food has six small soup dumplings. 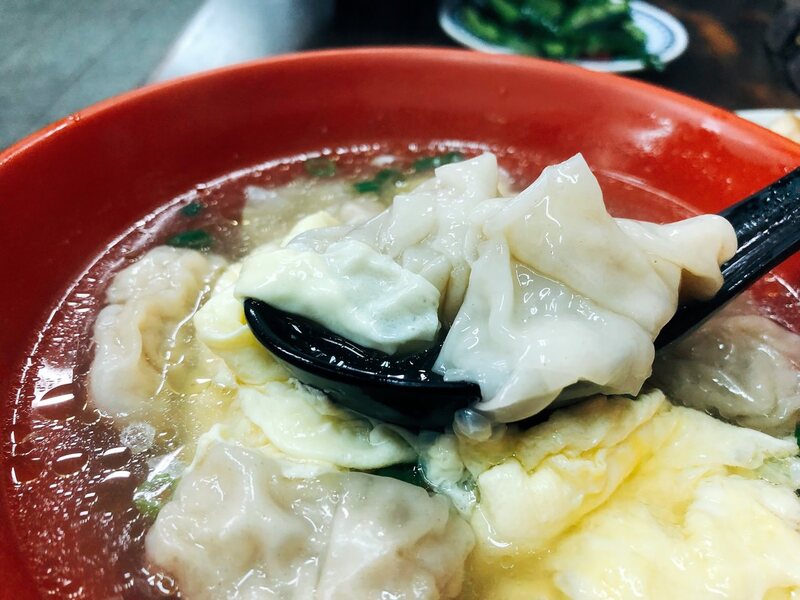 Due to the cost, the size is of course smaller than “Wonton Shop” near Nanking Sanmin MRT station. The dumpling filling meat is delicious but cant fulfill the appetite. I would suggest to add more dishes to enjoy the late night snack. My friend ordered this. I didn’t eat this. 四鄉五島馬祖麵館的知名小菜是酒糟肉, 朋友跟我點的則是豆干和花干滷味, 份量與 “北大荒水餃“” 差不多, 並沒有用像 “台北永康錄雞湯餐廳” 採用特別滷汁, 或是 “牛肉麵．雞湯”直接讓豆干吸收牛肉湯, 四鄉五島馬祖麵館的滷味屬於中規中矩, 但也是可以解一時的宵夜食慾. 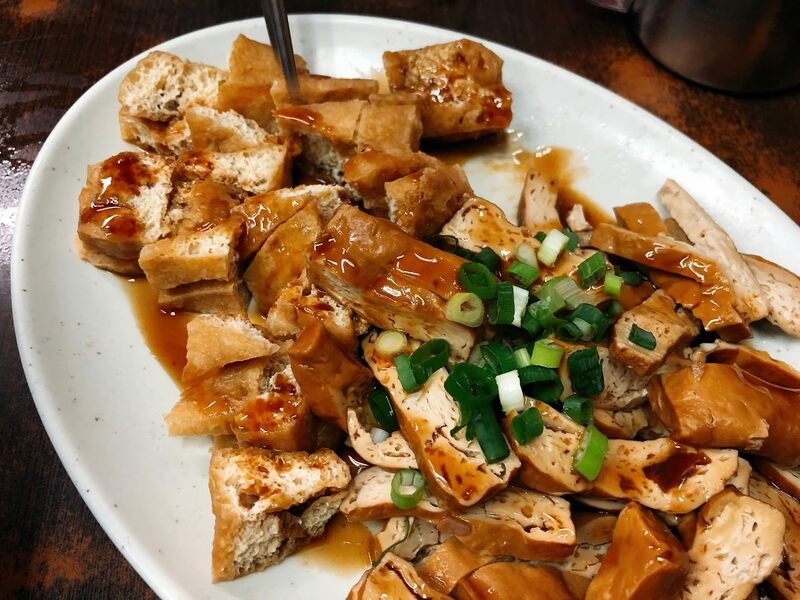 My friend and I ordered regular and large size Braised Bean Curd. 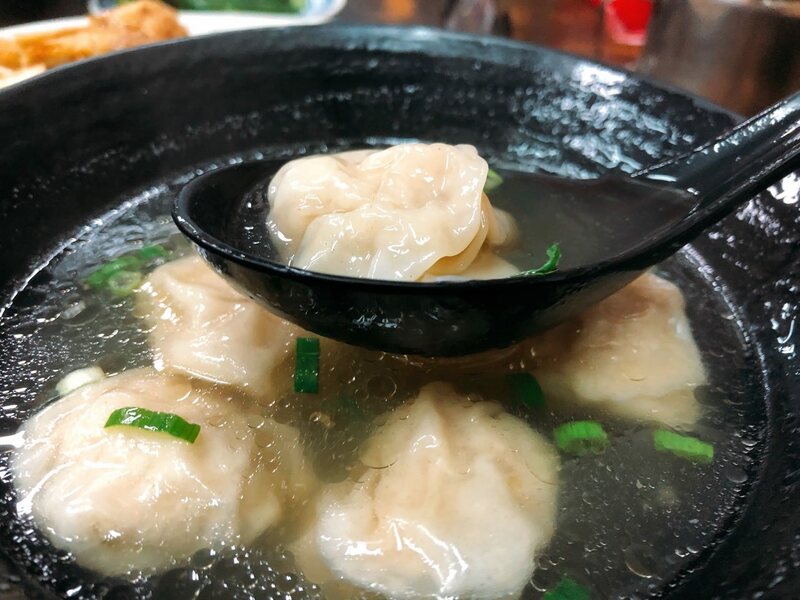 The quantity is similar with “Bei Da Huang dumpling”. 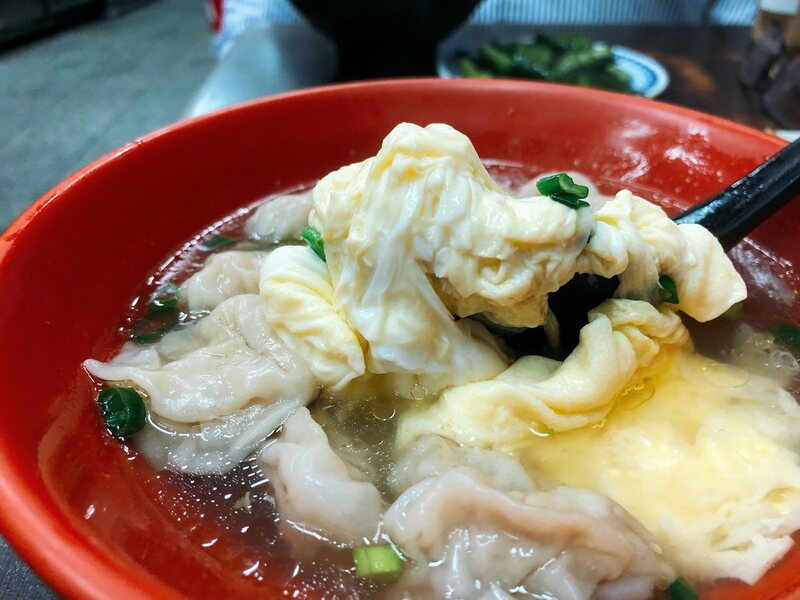 Unlike “Taipei Yongkang Role Chicken Soup restaurant” and “Beef Noodle.Soup”, Mazu 45 Food’s braised bean curd tastes average. But, it could fulfill the late night hungry appetite.